There are still a few things to be ironed out, but it's to do with firmware and - battery life and camera aside - the hardware is superb. A standard the rest must show they can compete with. Updated: now read our iPhone 3GS review. Apple is absolutely desperate to gain a foothold in the mobile market – what other explanation can there be for this incredible handset? When the original iPhone launched, the tendency was to forget about its faults. After all, the handset had been a revelation since Steve Jobs first announced it at Macworld in January 2007. The lack of 3G was a big problem, while no GPS, proprietary headphones, rather average battery life, poor call quality and a rubbish camera were all logged on the wish list. Now we have a handset that seeks redress with those foibles – the iPhone 3G. If you haven't used an iPhone before, you'll simply be amazed by the function and feel of this handset. If you have, things won't seem much different, but improvements have been made almost throughout. We said that improvements have been made 'almost throughout' because this still doesn't have the camera that many desire. The included 2.0 megapixel job is only suitable for quick snaps, but the ability to directly email your pictures means that we used the original iPhone for such diverse things as emailing snaps of clothes in shops, to sending the image of a packing label to a courier company. Video software is allegedly imminent, but we don't anticipate using it at this kind of quality level. But that's the only real gripe. Apple has improved the look and feel of the actual hardware. The footprint is much the same, though it's slightly thinner. The main change is its black (or white) plastic back. If you've owned an original iPhone you might well feel a certain attachment to your metallic-backed handset, but the plastic apparently complements the hidden antenna. The silver buttons on the sides also improves the appearance of the original iPhone, which still looks slightly hotchpotch from behind. Crucially, 3G means data transfer is far faster – as you'd expect of course – and data seems to work a lot more happily with this device. Sometimes the old iPhone would simply crawl. And that's the only disadvantage with having a full mobile web browser – you can't use WAP sites when the bandwidth gets tough. Email support is much improved – with Exchange and Mobile Me now sitting happily alongside the webmail providers. Mobile Me is so far unproven in our eyes, but that's a whole different story. GPS is a welcome addition, though we'd say the Maps app needs a lot more work to take advantage of it fully. It isn't completely clear when the GPS has a lock on, while it doesn't seem to follow your route brilliantly either. We'd point to the quite excellent (if slightly complex) Nokia Maps, which can even help with navigation on foot and orientates the map toward the direction of travel. Much nicer, so this aspect needs improvement, especially since GPS is one of the main selling points of the new iPhone. We've looked at the iPhone 2.0 firmware in more detail elsewhere, but we'll still refer to some of the new functions here. The new App Store is a welcome addition alongside third-party apps. Some are fun, like the £5.99 Super Monkey Ball, others ridiculous, like the free iPint. Productivity hasn't yet really been catered for yet – where are all the Google Apps we were expecting? Or MSN? AIM is there, but who uses it? Anyway, a nice touch is that there's a little indicator on the app icon to display any downloads. Elsewhere, there are other hardware improvements. The loudspeaker seems better and more audible, while the Home Button feels a lot more firm than on the old iPhone. Call quality also seems a lot better. 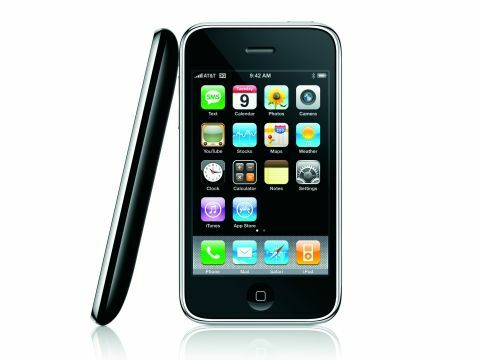 Compared to other top-end handsets such as the HTC Touch Diamond, the iPhone 3G is years ahead. A lot will also be written about Nokia's new S60-based touch handset, the Nokia Tube, but Nokia would have to pull something out of the bag to make it anywhere near as compelling as the iPhone 3G. That said, let's hope it's better for texting than the iPhone, which still suffers in this department. Maybe an on-screen keypad should be offered there. The way the iPhone is set up can mean you can't access the phone features as readily as you should, but Apple has gone some way to rectifying this with a Contacts app contained within the 2.0 firmware. Battery life isn't brilliant, that's for sure. Steve Jobs said that was one of the main reasons behind the original iPhone not being 3G capable. We see what he meant. You'll need to carry around your charger if you're away from home, as there will be none of the 'few days' you'd experience with many other handsets (especially if you watch YouTube videos). Mind you, we're not going to overly criticize the iPhone in this area – as anybody who owned the first Nokia N95's know – these powerful handsets need a lot of fuel. We had very occasional pauses with the old iPhone and, while we've been lucky with this new handset, we've heard several complaints regarding minor issues with the firmware. The great thing about Apple's methods is that such annoyances will be fixed by firmware. We can't let this review pass without mentioning the networks' role in the new iPhone. In the UK, O2 has worked wonders to ensure that the iPhone 3G is a superb offering. Predominantly, this is because all the tariffs include unlimited internet (well, 200MB under the fair use policy) as well as Wi-Fi connectivity via The Cloud, and even the offering of the iPhone on pay-as-you-go toward the end of the year. And then there's the masses of included minutes. £35 may seem a lot for a mobile, but unless you call exempt numbers or go abroad (turn off data if you do that!) £35 is what you'll pay. The £99 initial price, which is cancelled if you take the £45 or £75 contract, seems so small compared to the original that it's hard to resist. You'll either want one of these or you won't. But if you do, there's absolutely no reason not to take the plunge provided you're prepared to pay the elevated monthly charge. Some things need improving, but crucially – camera aside – they are no longer to do with the hardware. And Apple will update the 2.0 firmware many, many times, before this handset ends its life. It's really is time to buy.